Our main products are Cashew Nut Shell Liquid (CNSL), CNSL Resin, Cashew Friction Dust, Cardanol (Distilled Cashew Nut Shell Liquid), Phenalkamine, Epoxy Hardeners, Reactive Diluents and Adduct. All the products are reasonably priced and widely used in paints, specialty surface coating, marine paints, heavy automobile brake linings, industrial laminates, phenolic resins and repelling mosquitoes. Cardanol is a naturally occurring Phenol in light pale yellow color manufactured from CNSL. It is a monohydroxyl Phenol having a long hydrocarbon Chain (C15H27) in the Meta position. 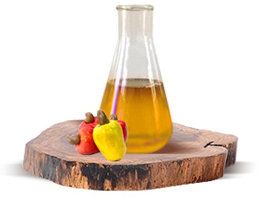 Cardanol also known as Cashew Phenol is obtained in the distillation process of technical CNSL under reduced pressure. The distillation takes place at high temperature and Distilled CNSL vapours are received through high vacuum. The average unsaturation of about two double bonds in the side chain of the Cardanol molecules make cross linking easy and provides a satisfactory gradual drying and baking properties to paints prepared from it. Because of its peculiar structure Cardanol Varnishes have high electric Insulation, greater resistance to water, chemicals and good flexibility. Cardanol is a phenol which has a C15 unsaturated alkyl chain with 1-3 double bonds at meta position. The component of commercial Cardanol differs in the degree of unsaturation of the side chain but for the practical purposes it can be represented by the following formula. Properties : One of the significant advantages of the Cardanol is its amenability to chemical modification to effect desirable structural changes so as to get specific properties for making tailor-made polymers of high value. Thus, structural changes could be effected at the hydroxyl group, on the aromatic ring and on the side chain. The unique Molecular structure of Cardanol, especially unsaturation of long Hydrocarbon side chain, makes the cross linking easy on Polymerization. Also besides the side chain impacts hydrophobic nature to the polymer, its coating is Water and Weather resistant. Cardanol is used as a primary building block for epoxy curing agents and epoxy diluents and modifiers. This natural alkylphenolic material has an aromatic ring that provides a strong chemical resistant backbone while the hydroxyl group gives strong adhesion and good reactivity for fast and low temperature cure. A long aliphatic side chain provides excellent water resistance, good flexibility, low viscosity, extended pot life, and excellent corrosion protection. Cardanol has an excellent properties ideal for the coating industry. It is widely used to manufacture Epoxy Curing Agents and other resins for Paints, Varnishes, and Laminates. It's widely used in Rubber, Pesticides, Adhesives, Mineral Oils, Break Linings, Electrical isolation putty, ink printing. The Cardanol based resins have good compatibility with other synthetic resins such as alkyds, epoxies chlorinated rubber, phenolic etc., and can serve as raw material for variety of paints. Cardanol can be substituted for phenol by up to 30% in phenolic resins used as plywood binding resins and for the lamination industries for cost savings purposes. Cardanol based resins show outstanding resistance to softening action of mineral oils and high resistance to acids & alkalis, it has antimicrobial and insect resistance properties. Cardanol Derivatives have been used as antioxidants, stabilizers and demulsifiers for petroleum products as well as plasticizers and processing aids for rubber compounds and modifiers for plastic materials. Cardanol and it Derivatives are also used as modifiers in coatings, adhesives, sealants, rubber, plastic, elastomers , composites and inks, in cosmetics for skin , in mosquito abatement, to coat granules used for fertilizers, insecticides, plant protection agents, fungicides and drying agents. Cardanol based resins have found extensive uses in automotive brake lining applications as binders/friction dust improving impact properties and reducing fade considerably by dissipating heat faster than phenol-formaldehyde (PF) resins. Golden Cashew Products Pvt. Ltd.
All Rights Reserved. Golden Cashew Products Pvt. Ltd.